Cape Town women aim to assist Syrian refugees on the Turkish/Syrian border by supplying them with much-needed food and household items. 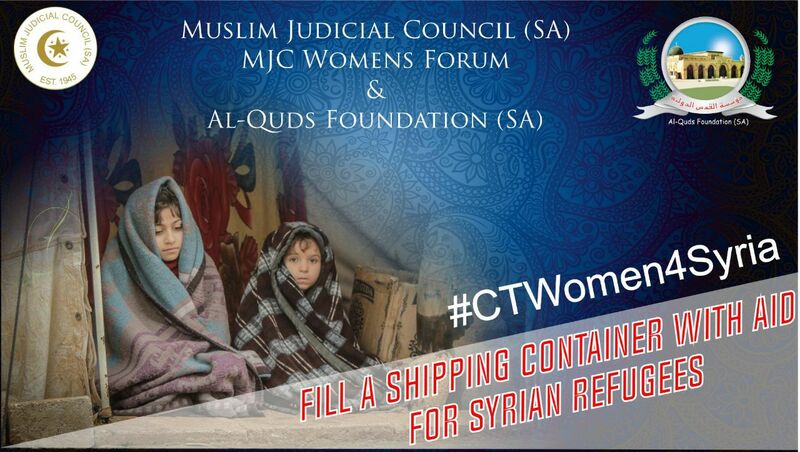 The Muslim Judicial Council’s Women’s Forum and the Al Quds Foundation (SA) intend to fill a shipping container with urgently needed donations of food and sanitary supplies to depart for Turkey on Sunday, 25th February 2018. The war in Syria is in its 7th year and has culminated in the worst humanitarian disaster in over half-a-century. More than 5 million Syrians have become refugees, according to the United Nations (UN). Some argue that the scale of the crisis even surpasses World War II. “I was there in 2017 and saw first-hand the refugee camps filled with women and children who don’t know if their husbands or fathers are alive and now have to fend for themselves. It’s heartbreaking,” said MJC Women’s Forum & Al Quds Foundation Member, Khursheed Allie. Become part of the co-ordinating committee raising funds/items among family and friends. *Please contact the respective contacts before dropping any goods. Share the initiative with your network. What are the cash donations used for? The money raised for this campaign will be used to pay for shipping costs including overland freight, customs and other admin expenses. What will happen to the container after it leaves Cape Town? The ship will leave after 25th February 2018 from the shores of Cape Town and will take approximately one month to reach Turkey. Members of the IHH Humanitarian Relief Organisation in Turkey will journey by vehicle to the various villages and refugee camps to distribute the aid to those who need it the most – namely Kilis, Urfa, Reyhali. “Can you imagine as a mother, burrowing into the snow with your bare hands to seek shelter for your children from the rain, snow and cold? Or even looking after your elderly parents and children but all you have is the clothes on your back? This is the everyday reality of these refugees. It is our duty to support those who do not have and hence we ask everyone to donate as much as possible so that we can serve humanity,” Allie concluded. The MJC is a Muslim Judiciary whose main functions relate to religious guidance, education, Fatawa, Da'wah, Halaal certification and Social Development (especially marriage counseling). It is a Non-Profit Organization in a country where Muslims are a minority group. The MJC adheres to the code of belief of the Ahlus Sunnah wal Jama'ah. It is the most representative and influential Muslim religious organization in the Western Cape, recognized locally, nationally and internationally for the religious, cultural and organizational roles it plays in South Africa.